Remember Cassini? It's the spacecraft launched in 1997 by NASA, ESA and the Italian Space Agency, meant to study Saturn and its moons. 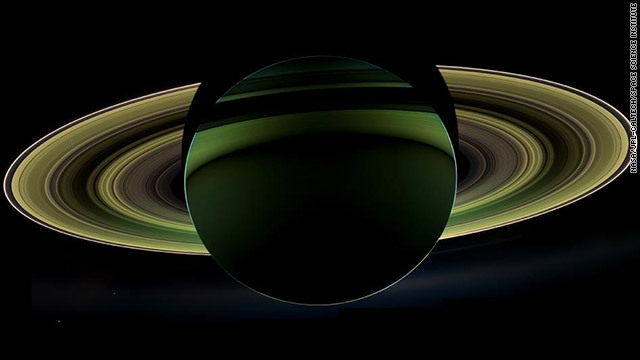 More than a decade after its launch, Cassini has returned beautiful images of Saturn, including this rare photo of Saturn, backlit by the sun so that the planet and its rings are highlighted. You can also see Saturn's moons, Enceladus and Tethys, on the left side of the planet as two tiny white dots. What makes this picture so rare? It's an enhanced-color view of the planet, comprised of photos taken using red, infrared and violet filters using Cassini's wide-angle camera. That in itself isn't rare, but the backlighting of the planet is: Photos like these can only be taken when Cassini is in Saturn's shadow. In 2006, Cassini sent home another backlit shot, in which our own planet makes an appearance, titled "In Saturn's Shadow." Want this one in all its high-resolution beauty? Happy holidays!
" It's an enhanced-color view of the planet, comprised of photos taken using red, infrared and violet filters "
I hate how these NASA guys always have an artist add crazy colors to their images. I want to see these kind of shots in real, regular, human eyeball color. I'm still trying to wrap my limited visual and spatial perceptions around the orientation of this photo. Remarkable image. Actually, NASA is going to use Cassini on December 21 to observe a rare alignment of planets. Not end-of-the-world stuff; rather, real science. See http://www.nightwise.org/blog/calendars-end/.